Hardy, tree-like plant with multiple branches - will grow to approximately a meter tall and 60cm wide. Is a prolific fruiter - a mature plant will commonly produces 40+ curved, long, slim, green pods that matures into a rich red. To encourage fruit, mist flowers with water daily. Days to maturity range from 80 to 120 days. 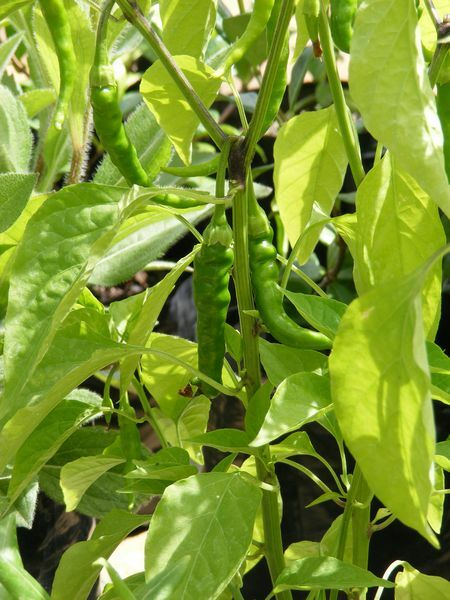 Attains maximum heat if peppers are left to ripen on the bush. Needs full sun and well-drained soil. Grown as an annual, but in frost free and low frost areas it can be grown as a small perennial shrub. Can be eaten green or red. Very hot in taste - 30000-50000 Scoville. The seeds of Cayenne Pepper are hotter than the pod. Use sparingly in hot sauces and as a seasoning in savory biscuits and cheese and egg dishes. Can be dried and powdered to make cayenne pepper. Fruit - fresh or dried for winter use. Use rubber gloves, or clean hot peppers under running water, to avoid skin burn from the pepper juice. Rich in vitamin A and C, calcium and other nutrients. Cures fever, colds and sore throats. Improves digestion, protects the heart by strengthening the arteries and regulating blood flow - preventing heart attacks. Reduces discomfort and swelling due to frostbite and joint pains by increasing blood flow to the area. Sprinkles Cayenne powder into gloves or shoes to keep hands and feet warm by improving blood circulation. A water-cayenne mixture helps to stop external bleeding. Reduces internal bleeding by even distribution of blood in the body and increases vigor and stamina. Consult a physician before using cayenne for medicinal purposes.